Apple ][+ Signed by Woz! As many of you know, I tend to keep old Apple products around our house way past their usefulness. 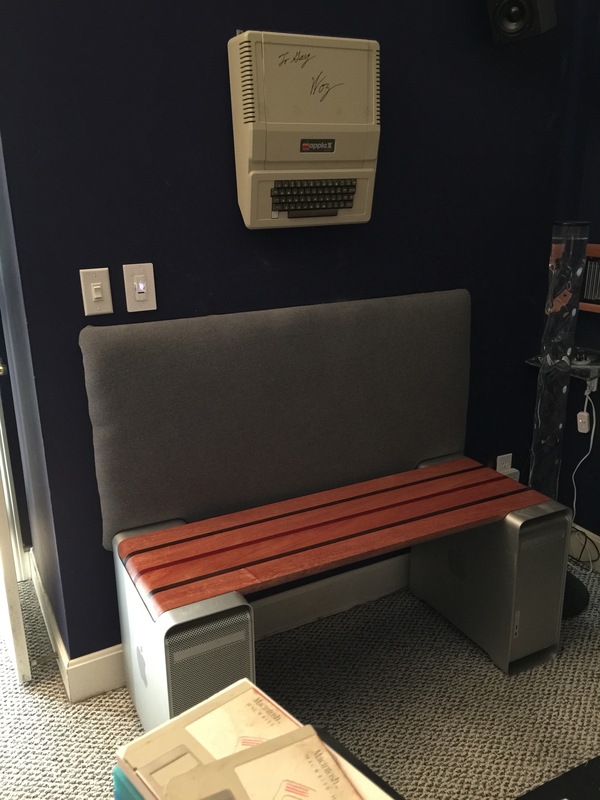 I’ve turned old machines into cases for new machines, G5s and Mac Pros into shelves and benches, hard drives and Airport cases into candy dishes, broken circuit boards into pads of paper, picture frames, coasters and even stranger things if you dig deep enough into this blog. But this time, I wanted to do something very different. I wanted to take an old iconic and personally very meaningful computer and get it signed by the creator. I started looking online to see what would be involved in trying to get Steve Wozniak to autograph my old original Apple ][+ and Apple ][e computers. I knew from the many interviews I’ve read by Woz that he loves his fans, and is usually very accommodating when asked to do things like this. After all, he did give away the original schematics for the Apple I for free to the members of the Homebrew Computer Club before Steve Jobs floated the idea of staring a company. After some searching I came across signedbywoz.com. This site offers the service of having Woz sign any item you want (at his discretion I imagine) for a set fee. To say Steve Wozniak is an incredibly busy guy is a huge understatement. He travels and gives lectures constantly, invests in interesting startups, plays Segway Polo, did a stint on Dancing With the Stars (I didn’t watch…I just couldn’t…), and is even looking into moving to Australia. Everyone seems to want a piece of him, and that feeling grew even more intense after his original partner, Steve Jobs passed away in 2011. So in early December 2014 I sent off the covers and nervously waited, hoping the postal service didn’t choose this particular package to lose track of. A few back and forth emails with his assistant followed and then, just a few weeks ago, I finally received the case covers signed by the man himself, with an included note of authenticity attached. It felt so strange and surreal to know that my Apple ][ that started me down the path of computer consulting and Apple fandom almost 40 years ago was actually in the hands of the person that invented it and started the personal computer revolution. 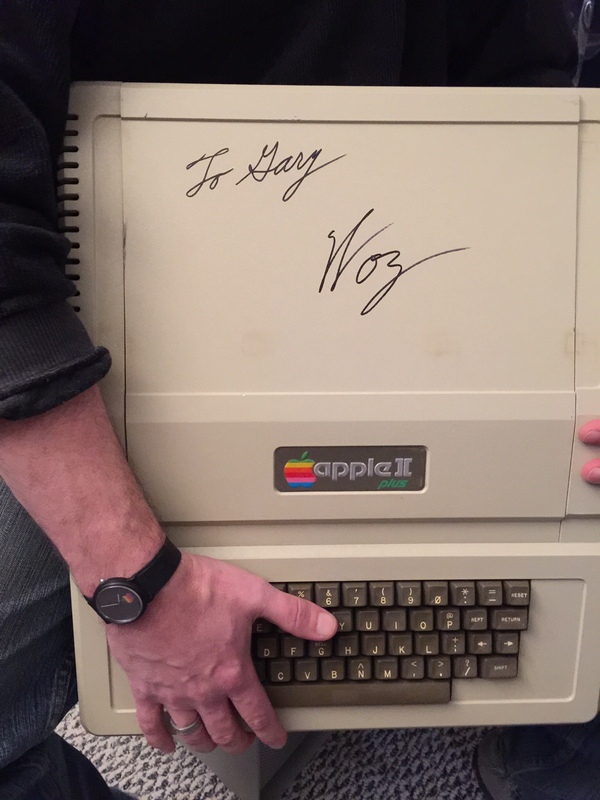 Here’s me proudly holding my original Apple ][+ signed by the one and only Steve Wozniak. I sent the Apple ][e case to my cousin Dustin, owner of Mac MD Los Angeles. This is one obsolete computer that I will only be recycling into cherished wall art, hanging happily above my Powermac G5 bench. Thanks, Woz!